So excited to share my interview with Lisa Evans for the Ottawa Citizen. A few weeks ago, Lisa (great name, btw) asked me for some tips on cottage decorating and how to incorporate local art and nature into your cottage decor. Today, this appeared in the Ottawa Citizen online. I’ll let you know when it’s set to publish in the Citizen. Click on the image below to read the article in it’s entirety. Thanks so much Lisa for making me sound so good! Congrats Lisa on your feature in the citizen!! How fabulous is that? You must be thrilled and so excited! I’ll check it out online – that trunk is so beautiful! Thanks Heather. It’s pretty exciting and it will be also in the printed version of the Ottawa Citizen Home’s section on Saturday. Congrats on the feature!! I told you your space was special!! Thanks Ozana you’re a doll! Have a fabulous weekend! congratulations! so exciting to be featured! Very exciting to be featured. Thanks for visiting Dani. I was so surprised to see this as I typed my name into Google as I do once in a while. I want to say Thank you so much for this publicity! My mom has been keeping the home sections of the Ottawa Citizen for me for years 🙂 She’ll be thrilled with this. I am very thankful that you mentioned my work. I want to offer you a porcelain cup if you like as a token of gratitude. You’re so welcome Clement and so sweet to offer me a “thank you”. It was my pleasure to feature a local talented artist. Cheers! Great article and congratulations on the feature – how exciting! Thanks so much Heather. Lisa Evans did a great job on the article and I was thrilled to be asked. Congrats Lisa – thrilled for you! 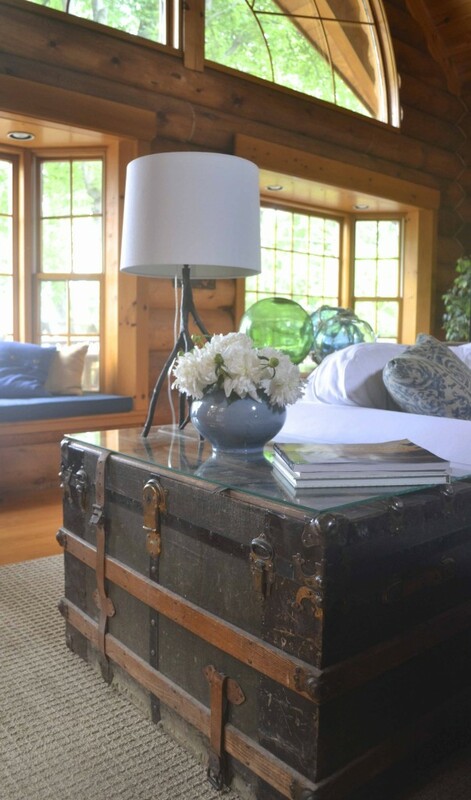 And so many memories are in your cottage – I especially love the trunk and the story behind it. Hi April, How fun! I was told the trunk dates to 1900-1901. My grandfather used it to travel from England to India. I’d love to see a pic of yours.